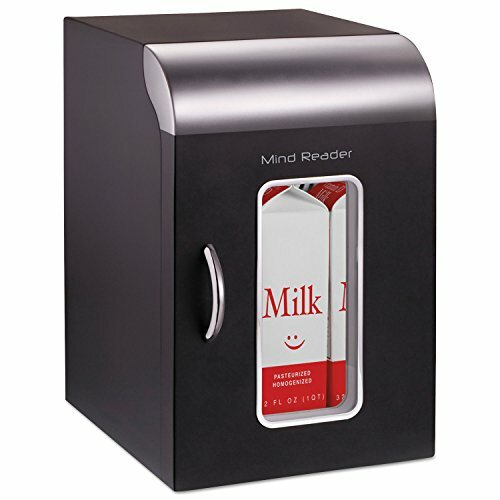 This little refrigerator is the perfect size for small containers of milk or other items you want to keep cold and close at hand. A removable shelf allows you to customize your storage space. A sleek, modern look with a chrome handle and black casing makes it perfect for upscale offices. Small fridge has enough space to hold two quarts or four pints of milk. Enough space for six to eight 12 oz soda cans. Sturdy mini-fridge with DC 12V, AC 110 and 60W of power. Capacity (Volume): 0.21 cu ft; Width: 8 2/3"; Depth: 10 5/8"; Height: 13 3/8". Modern look with chrome handle and black casing. Holds up to two quarts or four pints of milk. If you have any questions about this product by EMSREF01BLK, contact us by completing and submitting the form below. If you are looking for a specif part number, please include it with your message.